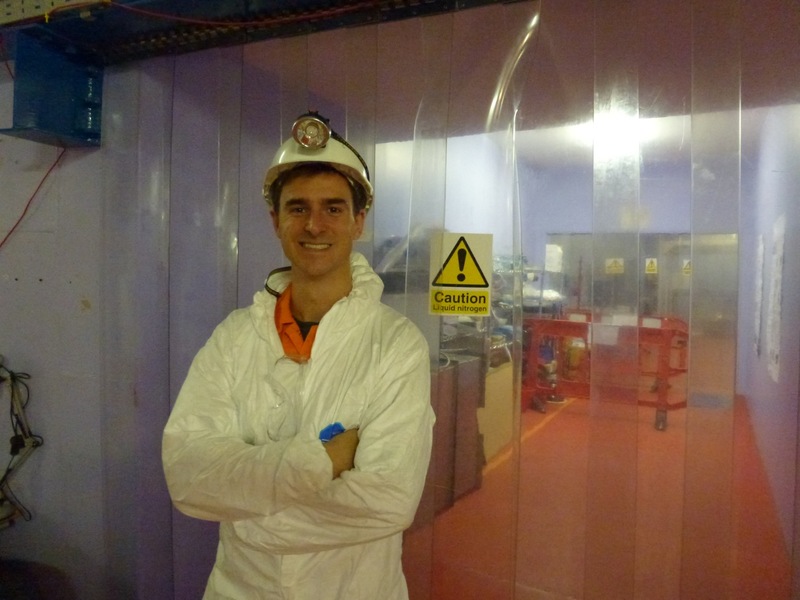 Lewis Dartnell descends a kilometer underground to visit a laboratory where scientists have spent twenty years searching for the elusive particles that hold our galaxy together. I'm standing apprehensively in the gloomy dark, my entire body vibrating with the shuddering metal cage I'm in, and surrounded by an overwhelming roar of air that's not so much heard as felt. I turn my head to peer out through a gap in the cladding and see the enveloping cliff of rock rushing past. 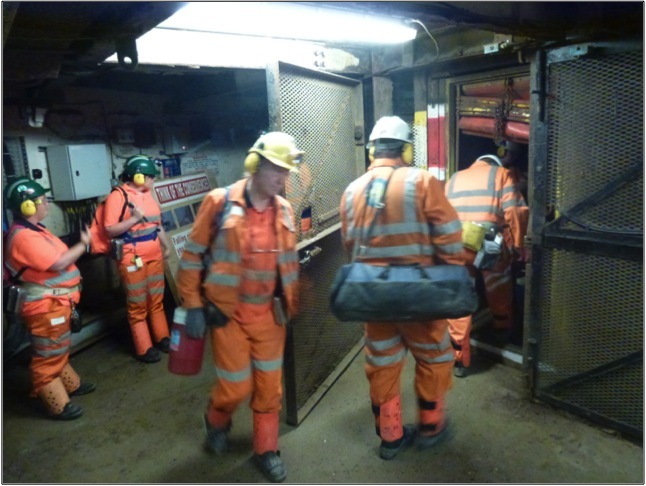 This is the lift serving the Boulby Mine on the north-east British coast, one of the deepest in Europe. The gale of air buffeting my clothing is from huge compressor fans ramming air down the shaft to ventilate the miles of tunnels below - to even get to the lift shaft we had to pass through a double set of airlock doors, our ears popping with the pressure pulse as we equalized. As we descend through the darkness the roar of the fans becomes steadily more muffled and distant, and the surrounding air grows warmer. Eight minutes later we descended over a kilometer straight down into the crust of the planet. Commercially, Cleveland Potash Ltd operates these mines to extract valuable potash, a vital component of agricultural fertiliser, as well as rock salt for wintery roads. Since opening in the early 1970s, over a thousand kilometers of tunnels have been burrowed down here. And if we were to follow this rabbit warren of branching tunnels out to their furthest extent, we'll have left the UK mainland behind us entirely and find ourselves many miles offshore, beneath the bed of the North Sea. But it's not the industrial operation I'm here to see today; it's the world-class science being conducted in these Hadean passages. These deep, dark and dirty surroundings are probably the last place you might expect to find a laboratory. But in fact, in many ways Boulby Mine offers the perfect location for conducting certain kinds of cutting edge research. 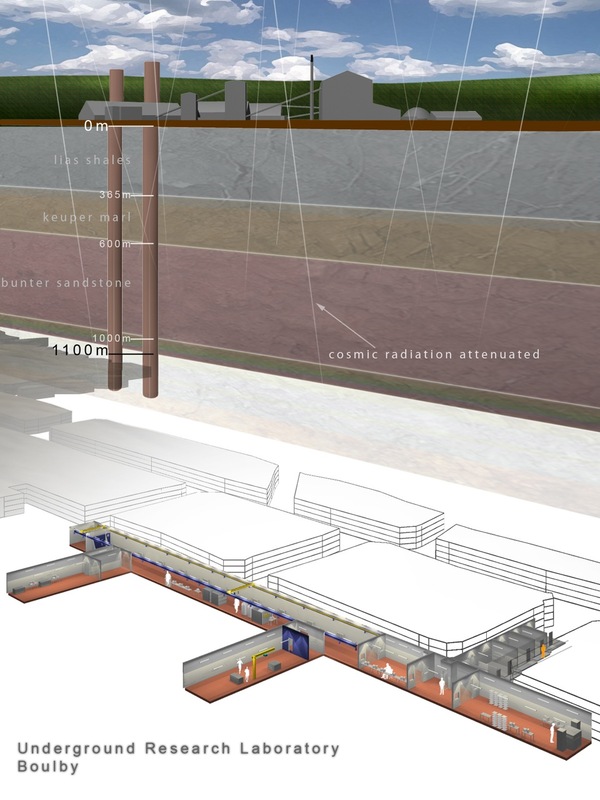 A kilometer underground lies a fully-equipped, internet-linked clean-room laboratory facility where scientists have spent the last twenty years searching for dark matter. Our Milky Way galaxy is a flat disk-like swirl of stars, held together by gravity as it spins. But when astronomers counted up all the visible mass in the galaxy – stars, nebulae, and so on – they realised there is far too little to account for the necessary gravitational grasp. Our spiral galaxy, and all others we spy through our telescopes, ought to have flung itself apart with its rapid rotation. There must be something unseen out there to provide the required extra mass and thus gravity: dark matter. The current best theory on what this dark stuff is is WIMPs, weakly interacting massive particles, and to hunt for these you need hypersensitive particle detectors. The problem is that any detectors built on the earth's surface are flooded with cosmic rays streaming down from space. Hence the dark matter lab at Boulby. Bury yourself over a kilometer down in solid rock and you can use the Earth itself as shielding. 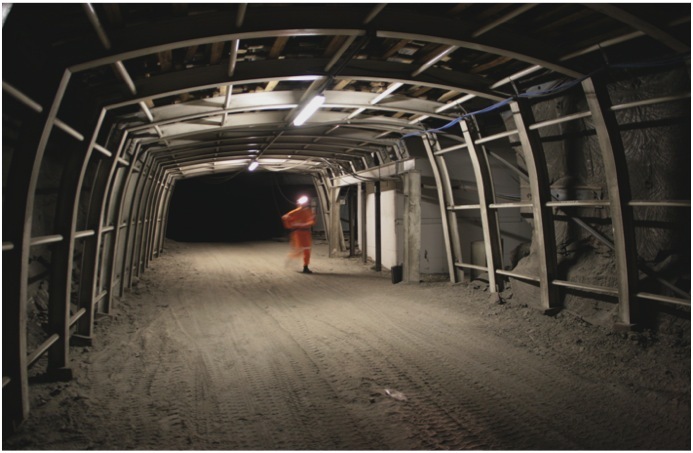 Even better with this particular mine, the surrounding salt and potash has very low concentrations of radioactive isotopes of uranium and thorium, and so this warm tunnel is one of the most radiation-quiet places on the planet. Perfect for hunting the most elusive stuff of the universe. But without first knowing exactly what these WIMPs are like, it makes building detectors to pick them up fiendishly difficult. So researchers must try a succession of detector designs, each optimized to check for WIMPs of a different kind. The lab director, Sean Paling from the University of Sheffield, quips that for a period of time the Boulby facility was the world leader in not finding dark matter. But this is all part of the process: when a sensitive experiment fails to pick up dark matter you can rule out that particular combination of properties for WIMPs and build another instrument to move on and test the next. Dark matter hunters are like explorers filling in new areas of the map as they push onwards, and a particular team can excel as a world leader in the search without having found WIMP signals yet. Walking onwards we see a bright halo appear ahead of us as headlights illuminate the tunnel walls. The digger truck rounds the corner and slows as the driver sees us. We step to the side, slipping slightly on the powdery floor of the tunnel. As the truck passes it draws behind it a billowing plume of fine dust, revealing the solid pencil beams of our headlamps swinging back and forth as if the empty volume of the tunnel has suddenly been made substantial. Lightly licking your lips afterwards floods your tongue with the tang of salt. 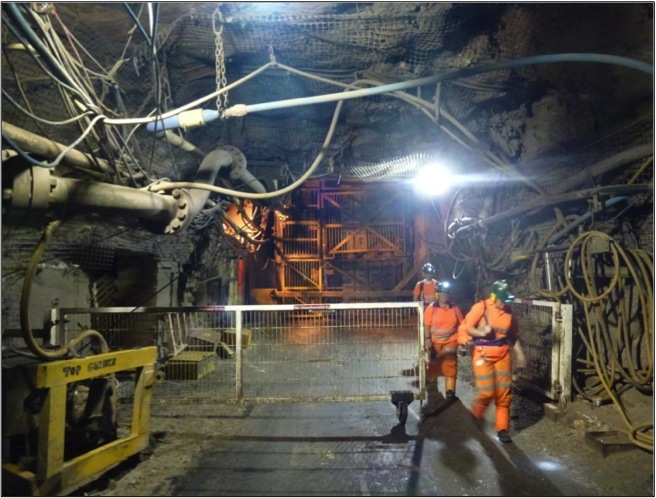 The salt and potash deposits that the Boulby mine burrows through were once on the surface, laid-down around 250 million years ago by the disappearance of an ancient sea. The Zechstein sea used to cover much of what is now northern Europe, but became cut off and started to dry-out, the dissolved salts and minerals precipitating onto the sea bed as the water became ever more concentrated. You can even still see the hexagonal desiccation cracks in the ceiling of the tunnels today. This ancient, buried seabed is an extreme environment and offers us a superb opportunity to study the adaptability of microbial life. I am an astrobiologist – a researcher engaged in understanding the limits of organisms on Earth, and the search for life on other planets and moons. 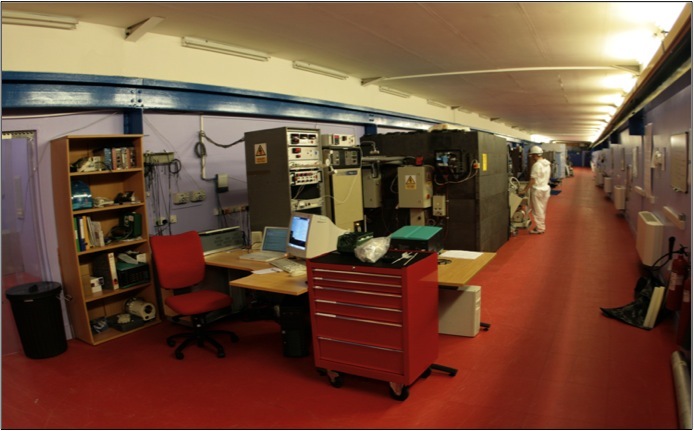 And next door to the dark matter detectors and other experiments, Charles Cockell at the University of Edinburgh has founded BISAL, the Boulby International Subsurface Astrobiology Lab. This deep subsurface environment presents huge challenges to the survival of life. It is of course completely cut-off from sunlight, with a very slow turnover of nutrients, the salt deposits create hypersaline conditions that hinder the growth of most organisms, and the rocks surrounding the tunnel walls are crushed under high pressure and at high temperatures with the internal heat of the planet. Yet, even down here Prof. Cockell and his colleagues have been able to find life thriving in warm brine pools, or spot signs of their past existence preserved within the salt crystals. This is of immense importance for the prospects of life off-world – what is believed to be very briny water has been observed trickling out of valley and crater walls from underground on Mars. Could these fluids harbour Martian bacteria? Some of the moons of the solar system, such as Europa and Enceladus, are thought to contain salty seas deep beneath their surface, and so Earthly “analog sites” like Boulby are crucial for understanding the habitability of these extraterrestrial locales. Cockell is also using Boulby to explore the opportunity for technology spin-offs between planetary exploration and mining on Earth. Mars rovers are equipped with equipment that can read the composition and mineralogy of rocks they encounter. And for a space mission these instruments must be very low-weight and low-power; design features that also make them ideal for miners to assess the quality of the ore in different places and so help direct the course of operations. It takes the solar system about a quarter-billion years to orbit around the galactic centre, which is coincidentally the time since the ancient Zechstein sea dried up and the Boulby deposits were created. So here we are now, one galactic year later burrowing far underground and using these deep strata to hunt for dark matter and understand the chances of life elsewhere. Dr. Lewis Dartnell is an astrobiology research fellow at the University of Leicester. His most recent book, The Knowledge: How to Rebuild our World from Scratch is out now in hardback.